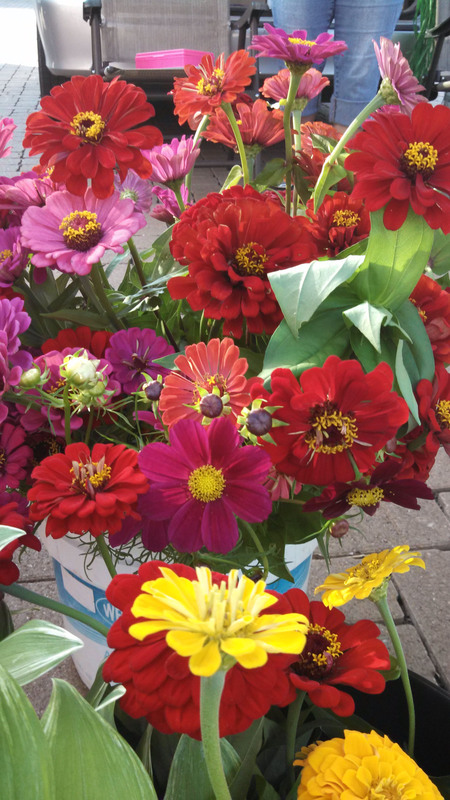 Why buy flowers at a grocery store when you can have these local beauties? It looks like we may be getting a little fall weather this weekend. We are also starting to see our fall vegetables. Greens like Swiss chard are returning. Squash and pumpkins have arrived. AND there are still tomatoes, peppers and sweet corn. We get the best of both worlds this time of year. Duncan Family Farm now has their full line of brats. So, if you have been waiting for those maple/blueberry sausages to return, it’s your lucky day! They will also have sweet corn. We are all lucky! Did you know that Invermos Valley Farms is taking pre-orders for turkeys? Yep. Stop by and chat with them. You can also discuss buying 1/2, 1/4 and 1/8 of beef to store up at home. Check out their “beef bundle” option. It’s great if you don’t have a lot of freezer space. If you haven’t tried the goat’s milk caramels or fudge from Colleen Meredith, you are missing out on something yummy. The Merediths will also have tomatoes, cucumbers, beans and grass-fed beef. Pam Schmutzler will have a variety of produce including the first of her fall Swiss chard, pecans, cookies and bread. Caleb Bax will have produce and mums. He’s had some really nice pumpkins the last couple of weeks. We will also have our normal selection of baked goods, gluten-free baked goods and bread, sourdough bread and crafts, fall bedding plants and vegetable plants, and cut flowers. It’s supposed to be a beautiful morning. Come spend a bit of it with us. By LU Market Manager in food, Market on September 13, 2013 .